This is the proposed casino’s reality. 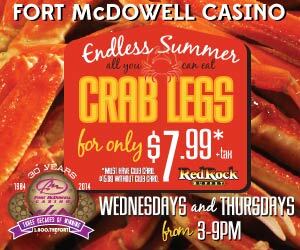 Fort McDowell Casino is currently running ads that offer Prime Rib on Tuesdays for $6.99 and Crab Legs on Wednesdays and Thursdays for $7.99. 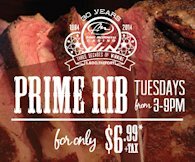 It’s not possible for a Yard House, Gordon Biersch, McFadden’s or Saddle Ranch Chop House at Westgate to offer these prices. You will not see prices like these at the Westgate restaurants for very good reasons: sales tax and regulatory costs. You see, these restaurants have to collect federal, state, county and Glendale sales tax. The Glendale portion of the restaurant sales tax is 3.9%. When state and county taxes are added the total rate is 11.2%.What sales tax does the proposed Tohono O’odham casino with its planned restaurants pay? Nada…zip…nothing. The icing on the cake is that the Glendale city council just voted to make the temporary sales tax increase permanent…just another stake in the hearts of these restaurants. Add to the unlevel playing field of all kinds of taxes paid by businesses in Westgate the myriad of federal, state and local regulations with which these businesses must comply. It eats into Westgate businesses’ profits to do so. As a sovereign nation the TO is not required to comply with federal, state, county or local regulations. What regulatory costs does the proposed Tohono O’odham casino bear? Nada…zip…nothing. TV Channel 5 weekly runs a “Dirty Dining” segment with recent results of inspections of restaurants in Maricopa County. Have you ever seen a Tribal restaurant inspection review? Of course not. Tribal reservations are not subject to these kinds of inspections. They are not subject to federal (OSHA), state, county or local health, safety and welfare regulations because they are a reservation and have sovereign immunity…consider the reservation as a foreign country planted within Glendale. A call placed to the Maricopa County Department of Environmental Services revealed that it has no jurisdiction over tribal restaurants and the Indian tribes regulate themselves. What regulations are there to protect the health, safety and welfare of the casino’s workers and patrons? Nada…zip…nothing. What do you bet one of the very first elements the Tohono O’odham (TO) will build is paved parking lots. Why, you ask? So they can undercut parking prices for Cardinals games, hockey games and other non-sporting events held at Glendale’s arena, less than a mile away. Is there anything that can prevent the TO from offering cheap parking? Nada…zip…nothing. I can see it now…shuttle busses packed to the gills disgorging seniors coming from the Sun Cities and Youngtown, spending their time playing bingo and the slots, then partaking of a buffet lunch or dinner before being whisked back to whence they came, never seeing the light of day at Westgate or Tanger Outlets. Recently I received over the Indian gaming transom some reliable estimates of what the proposed TO casino is projected to earn in revenue. The numbers are astounding. The numbers offered are not carved in stone but are reasonable estimates provided by people who would know within the industry. Estimates provided are that a new casino in Glendale would earn between six hundred million dollars and seven hundred million dollars a year in gross revenue. It is estimated that the Tohono O’odham’s net will be half that amount (50%) or three hundred to three hundred and fifty million dollars a year. The net amount reflects the subtraction of all costs associated with O&M as well as an amount of 1% to 8% of the tribe’s gross gaming revenue to the state. To put that in some kind of perspective, it is estimated the TO will net a million dollars a day. Think about that…a million dollars a day. Which leads to the question of why do the 32,000 members of the TO Nation average an income of $8,000 a year as Chairman Norris testified, under oath, before the Senate Committee on Indian Affairs this past week, “Most of our reservation land is located in remote isolated areas and our population is one of the poorest in the United States with average individual incomes of just over $8000.” The Tohono O’odham have 3 casinos operating in southern Arizona. Their website says, “The Desert Diamond Casino, owned and operated by the Tohono O’odham Nation, provides three exciting entertainment venues in Southern Arizona: Desert Diamond Casino (Nogales Highway), Desert Diamond Casino (I-19 & Pima Mine Rd) and Golden Ha:san Casino (Why, AZ).” It goes on to say, “The mission of the casinos is to provide the means for a better quality of life for Tohono O’odham Nation and all people in Southern Arizona.” If the TO are netting even a portion of these revenue estimates from its three southern Arizona casinos, why is part of the net not distributed to the Nation’s members by the Tribal leadership to reduce the poverty rates of its 32,000 members? It is widely known that 4 Glendale councilmembers directed staff to negotiate with the Tohono O’odham and the results will be discussed at their August 5, 2014 workshop. Rumor has it that the city council has negotiated something in the neighborhood of $100,000 from the TO. That’s got to be a joke. If it turns out to be true, once again, Glendale’s city council will get snookered…this time by the TO…all the while congratulating staff for their work and patting themselves on the back. They should demand…not ask…demand a 5% payment of the Tohono O’odham’s annual net revenue earned by all of the development placed on that site. It has a nice ring to it, doesn’t it? What does 5% equal? How about $15,000,000 a year? Doesn’t that number sound familiar? It’s the same amount the city must pay annually to IceArizona under the management agreement. It would certainly go a long way to relieving the tremendous financial pressure the city faces annually as a result of that payment to IceArizona. Are Glendale residents willing to sell their souls and bear yet another financial burden for not only a token payment but for the TO’s highly inflated numbers of temporary construction jobs and low-paying service industry jobs? Is this city council while pandering to a small number of extremely vocal residents that desperate and gullible? Is this the best that we can expect from our city council? Great job on research for this article. I also oppose the tribe possessing trust land in Glendale and have made the same general points regarding the absence of control over anything the tribe does on the property. I’ve sited the recent debate regarding bill boards along the 101 as an examle of how sovereign immunity would insulate the tribe from Glendale regulatory control. I predicted how the tribe could place a digital bill board half the size of a football field on the property and there would be nothing the city could do about it. Well, much to my surprise, while driving down the east leg of the 101 last night I discovered the Talking Stick has covered the outside of their hotel with neon or LED lights. Never mind a large bill board, how about a 10 story glow in the dark building to set the mood for the residents in the area. Also, how about the owner of the Bunny Ranch, who just offered Phoenix $500,000 to erect a ranch in Phoenix to service the Supper Bowl, makes the same offer to the TO Nation. Proponents of the casino say, that’s ridiculous, they’ll never do that. Well, the Coyotes were never supposed to go bankrupt and neither was Westgate. Right Path Development was intending to develop the area arround Camelback Ranch but they are gone. Things happens and once the ball starts rolling down the hill it’s very hard to stop. Excellent response Van! I’m with you all the way. I hadn’t thought about the additional activities that could occur on that property-as long as the TO’s agree. How about a mega illegal drug dispensary,etc. ? I really don’t know if the TO’s are bound by any federal laws on their land- if not the sky’s the limit..
Good job Joyce- you brought up some issues I never thought about. I never even thought of “Dirty Dining”. I usually enjoy your blog, but this time I am SOOOO hoping you are off the mark. Unfortunately I bet you are hitting it on the head. As I have said, casinos by their very nature are hostile to surrounding businesses, but looking at what you and Van DiCarlo (Candidate for Council in the Cholla District) have brought up, it is even worse. Yes they make their money inside the walls they erect, but they take it from anyone in the vicinity as well. I especially like the statement of how all the “West Valley Mayors support the casino”, well of course they do, it is in Glendale. The only impact on Peoria is being able to advertise a casino only 15 minutes drive from their sports and entertainment district. A nice day trip for their visitors. I wonder how supportive they would be if it was in the middle of the Peoria Sports Complex? As for staff “negotiating” $100,000 dollars a year, have they thought about the 1 million dollars in new police vehicles and fire trucks that the Gila River Tribes have given this year? If we support this casino, do you still think they are going to look so favorably on us next year?